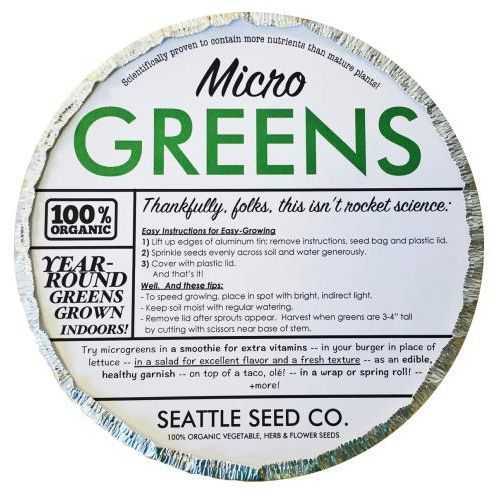 Everything you need to try Seattle Seed Company microgreens at home. This kit includes the following items. 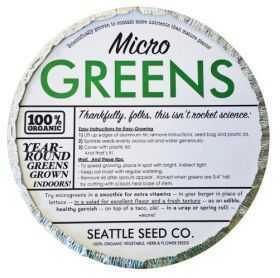 Two different varieties of organic microgreens seeds; one zesty and one mild (currently daikon radish and broccoli; selections can change depending on availability). Enough seeds for multiple plantings of greens. 1 round tray with plastic dome lid for speedy germination. 5 specially-formulated organic soil wafers that magically expand to fill the tray! Instructions for planting and harvesting. These precocious little greens will nourish your body, spice up your diet and look adorable on your windowsill!